Scalp acne is relatively difficult to notice unless you have very short hair, so it can easily be overlooked. After all, it's covered with all your hair. For those dealing with scalp acne, however, the problem can be annoying, painful, and often lead to hair loss. There are several common causes and easy treatments for scalp acne. But, as with any medical condition, consult your doctor before undertaking any treatment. People with oily hair are the most prone to acne on the scalp. 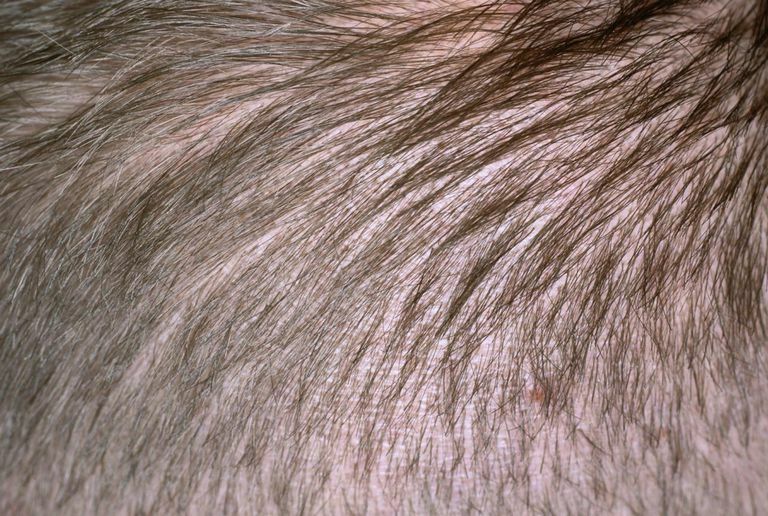 Scalp acne occurs when the pores become clogged with dirt and oil. This causes the hair follicle to swell up and possibly become infected with bacteria if the clog is not cleared. The blockage can be caused by overactive sebaceous glands (sometimes as a result of poor diet, hormonal imbalance, stress, or heredity) or by surface debris (often caused by poor hygiene or excessive use of oily styling products). Because hair can help trap dirt and oil next to the scalp, treating this form of acne can be a bit more of a challenge. The Menscience product is also free of dyes and perfumes. Neutrogena T/Sal Shampoo is also a good choice and works similarly. There's no surefire rule about how often to wash your hair, but you should never go longer than a week between washings, and that's pushing it. Every couple of days is a good rule of thumb for most people. It's a personal preference and depends on your hair type, style, and lifestyle. But if it starts to feel oily or it's gotten really sweaty in a marathon exercise session, it's time to break out the shampoo. Another good idea is to avoid using oily styling products; opt for products that are light and petroleum-free. A quality, light-hold gel is a good option. Of course, whichever styling product you use, wash it out of your hair each day before you hit the sack. This will help remove excess product, dirt, and oil, which can clog the pores. You can treat scalp acne with most any over-the-counter acne product on the market, although you may want to avoid products containing benzoyl peroxide because they can lead to bleaching or discoloration of the hair. Clean & Clear Advantage Oil-Free Moisturizer, which you can buy at supermarkets and drugstores, gives good results. The product is a light moisturizer containing salicylic acid and is especially good if you have short hair. It's free of peroxide, so you don't have to worry about bleaching. By using the right shampoo and conditioner, keeping your scalp clean, and cutting back on oily styling products, you should be able to dramatically reduce scalp acne. For those with more severe cases, your dermatologist can provide you with additional information and stronger oral or topical medications to help get the problem under control.